Among the many stereotypes that are tritely painted on artists as a whole with a broad brush, one I cannot wholly disagree with is quirkiness. That may be because I am known as quirky, but also, almost everyone I know – artist or not – is quirky in one wonderful way or another, so I know I am in good company! One of my eccentricities came out in bold form lately and I just had to share it, to inspire folks to step out of the ordinary for a while – just for the fun of it. Like many creatives, I doodle. A lot. Sometimes, I get an utterly irrepressible compulsion to doodle and I cannot rest until the itch is scratched. Sometimes the appeasement feels so darn good I keep scratching away until the doodle becomes a finished drawing. This is not always convenient, like when we are traveling and I have no pencil or paper…but I manage to make do with what’s on hand. Yes, it’s a Bic. I absolutely love it. This shows I’m still connected to my photorealistic roots, but rest assured, my Neo-Pixellism is still in full swing. More updates when my next batch of art is suitably “scrumptious” as pie! All content on this site © 2013-2018/present L. Eilee S. George; all rights reserved, except where otherwise noted. 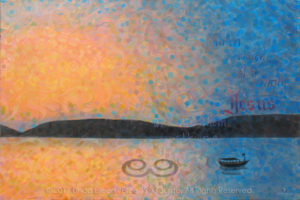 This entry was posted in Anecdotes & Musings, New Art! and tagged New Art on August 4, 2017 by Aiii. Three Trees is a work I had been considering for a few years, lacking any photographic resources from which to draw. There are three major trees in the story of God and man. Sure, there are other trees, like the fig tree that Jesus caused to die because it wasn’t bearing fruit, and the tree that temporarily shaded Jonah while he fought the Lord, but none so impacted the fate of mankind as the stories of man’s fall, and Jesus’s offer of salvation, and the promise of eternity in Heaven with God. The possible exception is the burning bush, and it’s not technically a tree, and deserves its own painting, and at any rate, I wanted to stick with a triptych to reference the Trinity. 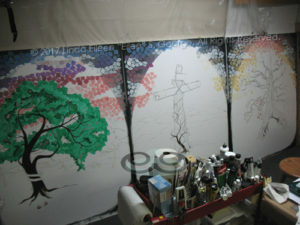 The first painting is The Tree of Knowledge of Good and Evil, the catalyst by which Adam, and through him, mankind, fell. This is The Rebellion. You can see the two pieces of fruit at the base of the tree, each with a bite removed from it, representing the Original Sin. The serpent wrapped around the trunk, returned to the scene of his crime, of course represents Satan and his power over mankind in this life. 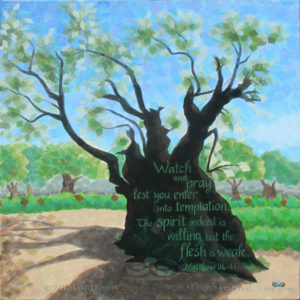 The second painting is The Tree of the Cross, the site where Jesus took the pain and punishment for all our sins in order to offer to us a way to salvation, to avoid damnation, to return to our right relationship with our Father. This is The Redemption. I chose to depict the cross as a more naturalistic form that still harkens back to the tree from which it was constructed. Researchers have found that sometimes when finished timbers were in short supply, crucifixions were actually performed upon olive trees outlying the city, along the road as a warning to ne’er-do-wells. This tree is not the proud, straight cross often shown as the instrument of Jesus’ death; it, like Him, bows in humble obedience. At the top of the Cross is the sign with the inscription, “King of the Jews” in three languages: Hebrew, Latin, and Greek. At the base of the Cross is a dogwood sapling, long symbolic of the Cross in our own culture with its four blood-stained petals. It is indigenous to neither here nor Israel, but is native to the Mid-US from which the artist harkens. The third painting is The Tree of Life, which was removed from the Garden of Eden when man sinned, so that he would not eat of it and remain in a sinful state for eternity – thus giving him the chance to accept God’s gift of salvation and receive the reward of eternity with Him and all the kept promises of Heaven. This is The Reunion. 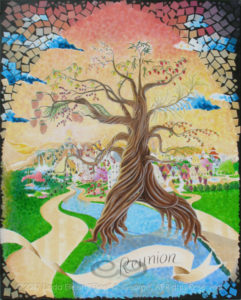 The massive tree reappears in New Jerusalem, growing either side of the River of Life, which flows from the Almighty’s throne, bearing a bounty of twelve fruit and grains every month for the partaking by residents of this Holy place. Fruits depicted are not listed verbatim in the Bible, but research has given the artist a good guess with the Seven First Fruits and other plants native to the land at the time of Jesus’ life on earth among us. The Tree’s leaves heal the nations, represented by the City’s many architectural styles. 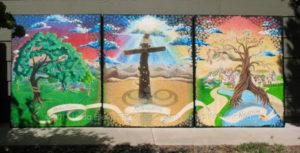 This triptych tells the story of God’s relationship with mankind in a succinct summary of major turning points, of mercy, discipline, and grace. It is told in the context of a Protestant Christian viewpoint of pure scripture in both the Old and New Testaments. 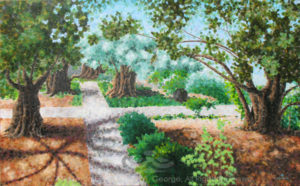 The format of the paintings abstractly suggests Gothic stained glass windows and mosaic works (akin to those in cathedrals) to which my work was often compared even before this series; they are rendered in pigments derived from minerals of the earth onto canvas woven from plants of the earth by a human who was ultimately the result of another human rendered by God from the earth. I am honored to share the action of creation with my Creator, and joyful to share His Message and Promise with you. Prints of these works are available through special order. Contact the artist directly here. Read about the entire series here. This entry was posted in New Art! and tagged Faith, Method, New Art on May 2, 2017 by Aiii. 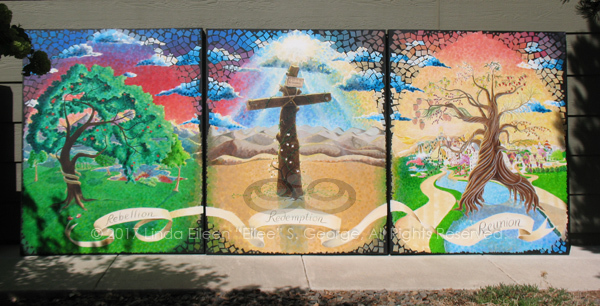 On April 29, 2017, artist Eilee George dedicated with Calvary Community Baptist Church of Northglenn nine new works, many of massive proportions, depicting significant sites in the walk of Jesus, and including a triptych featuring three key trees in the Bible. 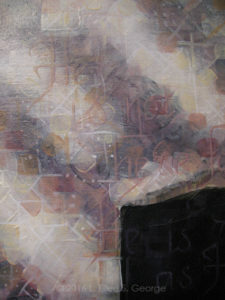 Knowing that people often want to know the background, reasoning, symbolism, technique and inspiration for works in order to make a deeper connection with the art being viewed, the Church asked the artist to give a presentation explaining the works in the context of meaning and method. I’ve been asked to give some context to these paintings you suddenly see everywhere. Pastor Brian is a brave man to ask someone as verbose as I am to make a “brief” presentation – but I’ll do my best! When I was asked to highlight our renovation with some artwork two years ago, I jumped onboard with both feet. I was very honored and intimidated and full of hope. I had full artistic license to do whatever I wanted – creatively, an artist’s dream commission. I took my responsibility very seriously and had plans to study my brains out. Not twenty-four hours after I was given this opportunity, another one fell in my lap. My mother in-law, Sheryl, called and said their tour group to Israel needed another body to hit quota. She offered it freely, no obligation to me but to show up and have her back – and she offered it without any knowledge that I had received a request to paint art for a church. God’s will mobilized both her and myself. There was no other way I could have afforded to go. I had never been out of the US and had no passport and just a short time to get one, but God moves in very purposeful ways. 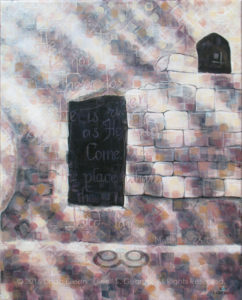 Is there any more perfect trip to gather resources for church paintings than eleven days in Israel? Amazing. Now, I feared traveling so far, and flying in general, but cast fears to His care, and He got us through a very difficult flight and a few exciting episodes while abroad, and got us all home safe, praise the Lord. It’s a trip every believer should take. I was looking at sorting through some 10,000 photos I had taken. I kid you not, I’m very OCD. I needed material for this work and I had one chance at it. Once home, I had to choose images to paint that weren’t just great photos, but also would gel well with my very patterned, Neo-Pixelist style. Not just any work will do; it needs a balance of space and detail. When I paint, the patterns create an entirely different painting up close than you see when all the strokes melt together from a distance. This involves a lot of walking back and forth across the room while painting, squinting, and juggling different types of eyewear, in my case. The technique displays the particulate nature of all matter – that on an atomic level, we’re all made of the same stuff – but more than that; we’re molecular and systemic and all connected; relationships are key between us, and that parallels our relationship as the created to our own Creator. It’s atomic Gestalt theory in pigment: the whole is greater than the sum of the parts. After months of sorting, choosing, revising and second-guessing, I chose what to paint. Then I had to get enough courage to put brush to canvas. I didn’t feel talented enough for such a mission! But God doesn’t call the equipped; He equips those He calls. When I prayed for His help, I literally felt the Holy Spirit guiding my decisions and my brush until I had enough confidence to persevere. I listened to a huge playlist of inspiring music while I worked, and eventually just listened to sermon after sermon on Grace FM to paint by. I sang hymns and cried and prayed and laughed, and it all worked out very well I think. So on each of the individual paintings, a few words. There’s the triptych, here behind me…a word that refers to 3 artworks shown side by side as a unit. Then there are six smaller ones. We’ll start with the six. 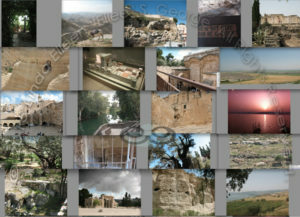 Each depicts a site that is significant in the life of Jesus, and each features a scripture that directly relates to that site. In most of them, I purposely worked the scripture into the pattern of my brush strokes for a reason: it is subtle, in order to force you come closer, to pay attention, to meditate on the work – just the way one should meditate and linger in the Word, to increase comprehension and mindfulness. The first work I did was the Garden Tomb. There are differences of opinion among different denominations as to actual site of the tomb; being so long ago many sites were “best guesses” but you still felt something “real” at times. We went through Church of the Holy Sepulcher but I did not feel Him there like I did in the area of the Garden Tomb. For this work I decided to go with theories that seem more compatible with Baptist beliefs. The Garden Tomb area is more peaceful, humble, and simple – and a place of quiet contemplation – devoid of icons/idols, rituals and dogma. For me it had to be the Garden Tomb. This little 16″ x 20″ jewel was the first of the series, and I did a lot of experimenting. 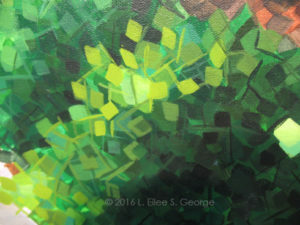 As I paint, I shoot progress shots with my camera to show its development, and this one had a lot of initial experimentation in technique; I recorded having put 22 layers on this relatively tiny work. The Garden of Gethsemane is actually split in half by a narrow street; one half is adjacent to the Basilica of the Agony. This painting is from the the Basilica side of the street, although I saw the other side to be more restful for meditation. The trees are certainly ancient. In my test versions of planning, I tried both day shots and night shots. I wanted to think about doing a night scene because it’s my impression it was night when Jesus went there to pray right before His arrest. In the end I thought that a night scene would not have the right color palette for a church and I went with daylight. This 30″ x 48″ work has 33 layers of paint to achieve its molecular effect. Next: the River Jordan, a 24″ x 36″. 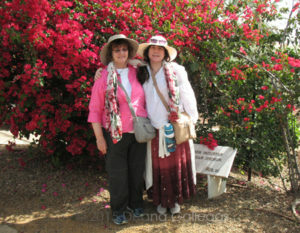 Few sites are available to tourists who are getting baptized in the Jordan as we were. We went to Yardinit, a deep area of the river except on the side of the baptismal stations. Much of the structure in this area is obviously modern, so I replaced with interpretations of random rocks and plant life, reminiscent of an early ruin, once I got around to Photoshopping my concept. The area we were in was lush, and it spoke to me of new life – like that represented by baptism itself – so I kept that aspect in my own version. I weighed the possibility of actually depicting Jesus and John the Baptist in the act of baptism, but sometimes depictions of Biblical persons can be controversial for a few reasons, and I am mostly a landscape artist, and that is what I was known for when I was asked to do the work, so to keep all of the work consistent I stayed with landscape, deviating only to superimpose a luminescent dove representing the Holy Spirit. 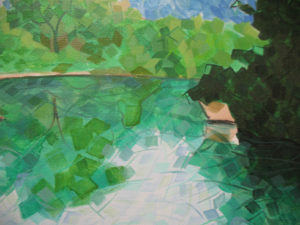 The water is where my style really started getting flexible and curvy, and it developed even more in the next painting. For a while I considered the simple shots I had taken of the Sea of Galilee, testing them for compatibility between my style and their composition; I found that they could be terribly dull unless I really stretched out of my comfort zone. Looking at all that sea and air, and painting the way I do bringing life and vision to smaller elements of matter, I decided to imagine both the air and water currents and those elements swirling around in them. This, plus sunset colors, made my 24″ x 36″ Galilee look psychedelic in the early phases, but many layers of tinted glazing took the edge off and gave it harmony. 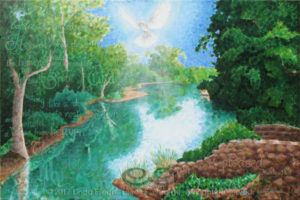 I briefly considered including a ghostly image of Christ walking on the water, but again, I decided to stay consistent and retain the original scope of landscape art, which is often contemplative on its own. Calvary…in front of the Old City in the Second Temple Period…while in Jerusalem, we went to the Israel Museum, which had an enormous model of the Old City during the Second Temple Period, the time Jesus walked among us. I planned this painting, like I did with most of them, on Photoshop, but it was more complex, in that I had to remove the walls and tourists, and figure a more fitting background, and I had to choose an appropriate angle for the emotional impact I had in mind. I scrutinized the legend of the model, and guesstimated the approximate historical location of Golgotha and the cross in relation to it. You only see a beginning of the Temple’s Women’s Court on the right; mostly featured is the adjacent Antonia Fortress. This structure seemed to mirror the hardness of the chronical it faced, so I superimposed from my photography portfolio a dramatic post-storm sky from our very own Colorado that seemed to hold God’s light. This canvas is rather imposing at 36″ x 48″. This Ancient Tree of Gethsemane is adjacent to the Basilica of the Agony and is estimated to have been there at the time of Jesus’ life. Today the trunk’s girth measures more than 13 feet. It is weathered and scarred, showing the wounds of a long and fruitful life. To reflect this, the painting shows this survivor with a sturdy, solid trunk, but tissue-paper collage delicate greenery. It was overwhelming to be in the presence of such an ancient olive and consider that He may have prayed at the root of this very tree. 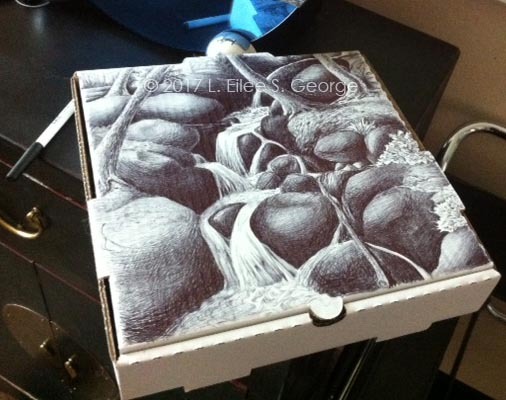 This work is 24″ square. So that’s the six. Now the triptych. The Three Trees Triptych were by far the most challenging of the group – I had no photographs to lean on; only Scripture and my imagination. For the group as a whole, I decided after long consideration and several other failed ideas to simulate the idea of the gothic-arch frame, along with an exaggerated version of the mosaic/stained-glass effect that my work is known for – an appropriate technique…for paintings to be hung in a sanctuary! I kept a log through all the paintings and took progress photos as I went. This got really complicated with the triptych because I had to regularly work among them in order to coordinate colors, align adjacent elements, and figure the direction of the light. I even had to rearrange my entire studio in order to accommodate three such monsterous works side by side (each canvas is 48″ wide and 60″ tall), and they barely fit in the dim little basement cave that I call my studio. Just finishing them was a small miracle. Let’s take a look at each of the three works individually. 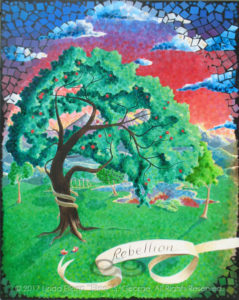 Rebellion is the first panel of the triptych. Not a lot is available for source material to paint the Garden of Eden. There are scriptural references of course, but much is left up to the imagination. The area of the intersection of the Tigris and Euphrates Rivers is suspected, and any river valley should be lush, as was the Garden itself from all extrapolation. This Tree is the hardest of the three to depict, as it has no distinguishing characteristics by which to recognize it. To reveal its identity, I wrapped a serpent around the trunk, adding two hastily-dropped half-eaten pieces of fruit in his shadow.The concept is loosely based on the account in Genesis. This scene was the catalyst for the fall of man in his relationship with God – a rebellion. 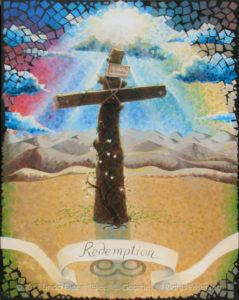 In Redemption, I turned the composition to face Jericho’s distant barren hills, and to include the sun bursting through dark clouds as on the day of the crucifixion. This also serves as the main light source for all three paintings of the triptych, the throne in New Jerusalem scene to the right notwithstanding. Inclusion of the non-indigenous dogwood sapling is a nod to our own culture and its symbolism in the four white, blood-stained petals that draw a parallel to Christ on the Cross. It isn’t even native to Colorado, but it is very much from the place where this artist grew up. The vines emanating from the base of the Cross symbolize the new life offered to us in the presence of our God for all eternity by Christ’s sacrifice and atonement for our sins. I thought I had a decent idea of what to do with the last panel, called Reunion – until I started comparing Revelation to Ezekiel. I had several meetings with Pastor Brian and others on these seeming conflicts, and consulted various tomes including Randy Alcorn’s book entitled “Heaven”. I pored through heavenly depictions through art history; I watched videos that alluded to it; I read online comparisons between accounts by different prophets and apostles. I prayed hard on it and decided to go with a version from Revelation, realizing it is likely not any inherent “contradiction” but rather speaking of a different time from Ezekiel (eternity versus the 1000 years); therefore it makes sense that there would be some differences. Showing the great City from the inside out also presented a challenge, as many descriptions talk about the gates and foundations that would not be visible from the interior of such a vast place, and descriptions aren’t highly detailed from that perspective. The Bible reveals that the Tree of Life grows on EITHER side of the River of Life, so I had to resolve how that works. The Seven First Fruits and other native crops were used for the twelve crops on the Tree. Combining the reference to the healing of nations as well as Christ’s promise to go and prepare a place for us in His father’s house of many mansions, gave me license to show architecture of many cultures in close proximity and harmony. These works are a labor of love. The whole time I painted them, I prayed that they might inspire someone to seek God, to seek closer relationship with Him, to seek their own spiritual gift and to dedicate themselves to honoring Him with those gifts. I did this and found that the gift again is to me, and at this crossroad I look for God to guide me to His will for my next steps. Thanks, Sheryl, for taking me on the trip of a lifetime; thanks Greg for your steadfast support through all of this; thank you to my families by blood, marriage and here at the church for your inspiration; I couldn’t have done it without you; thank God for His help and facilitating my spiritual and artistic growth. Thank you for sharing my journey. See better pix of these works in THE GALLERY. Speech derived from this copy © Linda Eilee S. George and performed live April 29, 2017 at Calvary Community Baptist Church, Northglenn CO. Visit their site to learn more about CCBC. You can find them at 11980 Irma Drive (at 120th), Northglenn, CO 303-452-0056; services at 10:30 am Sundays. All content on this site © 2013-2018/present L. Eilee S. George; all rights reserved, unless otherwise noted. This entry was posted in Art Events, New Art! and tagged Exhibit Notice, Faith, New Art on May 2, 2017 by Aiii. I’m gonna spill a secret. For the last few months I’ve been working on a new series rather covertly. It’s one I had been gearing up for since April of 2015, when I went to Israel. I had just been asked to do a bunch of artwork for my church following a renovation, and literally the next day, without my initiation or anticipation, a trip to Israel just dropped into my lap. Is there a more perfect way to gather sources for art for a church? These things happen for a reason, and it was with this in mind alongside my trepidation in leaving my native country for the first time ever (to visit a place which, while immensely inspiring, was also in the news constantly for violence and unrest), that I trusted God’s plan, told my irrational fears to get lost, and accepted the invitation. Knowing I’d never be able to afford to return in time to gather more material for my commission, I took many thousands of photos while on tour there. I was determined to capture some amazing photos, and luckily I had trained for years to frame a balanced composition in a split second. Being of the philosophy that one has to take a hundred photos to get one really magical one, I took almost 10,000. Yes, you read that right. God bless digital cameras. Needless to say, it took months to sort through them all, and to identify all the places and rename the better ones appropriately, decide on a theme, pore over fonts, carefully curate between so many good options, and narrow down what I would actually paint for the church (who are giving me a stipend). I also cropped a few reference photos for emphasis or stitched a few photos together, and decided that each painting would contain scripture tying directly to each site being depicted, so there was additional research to be done (hence the font poring). The extent of artistic license and interpretation also had to be determined to some degree. Distractions from this mission were swatted away until I “got it” that this was what I was supposed to do now. Between the epic amount of sorting, the self-doubt, a detour almost getting a really cool job (which had such a horrific commute it would have obliterated any time or energy to paint), and several poignantly-timed illnesses that forced me to stop, think, and re-assess my priorities, it was nearly a year before I actually touched brush to canvas. Luckily my clients were in no rush, and gave me full trust and creative autonomy. Here I had to face another fear: that I wasn’t good enough for the project. Most artists have this gnawing self-doubt, even when it isn’t earned. Society gives creatives a lot of mixed messages concerning their “worth”, but they aren’t the ultimate measure, nor is money. Don’t get me wrong – funds to afford food, shelter, a studio and art supplies are quite vital, but that isn’t necessarily the purpose for creating; it is essentially a facilitator. Money is a terribly inadequate means of measuring the value of most things that matter, and public response can be swayed by too many fickle factors. Art is nearly as impossible to measure as a feeling or a life. It is more a matter of quality than something quantifiable, and what I mean by quality is how it impacts lives – either that of the artist, or of cultures or sub-cultures, or that of others such as collectors or anyone else who views art with varying purposes. It can calm, inspire, educate – even be a call to action. I have hope with this series that I might inspire viewers to seek relationship with God, if not simply to serve to glorify Him with the passion and skills He graciously and abundantly bestowed on His not-quite-humble-enough servant (hey, I’m a work in progress too). I may never learn what impact anything I do actually occurs, but my knowing is nonessential. There’s a subconscious meme in our collective awareness that is a picture of the writer facing the blank page – or the artist in front of a blank canvas – that it is the most intimidating thing in the world to pull something from nothing and create something there. This is where I was after all my preparation…preparation that probably took longer than it should as an indirect result of that fear. Eventually I had to face the fact I must do something. Not that I hadn’t been doing something, but I had to get on with the show, so to say. Restlessly wandering around in my mind with a feeling of disquiet, I frankly wasn’t putting the right effort into figuring out what was wrong yet. Then the Spirit hit me with the notion I needed – duh, I needed to pray about it. So I did. I dropped to my knees, and told God I didn’t feel worthy of my commission, and that I probably wasn’t – but that I knew I could do all things through Him Who strengthens me. I asked for divine assistance. Boy, did I get it! Now…I’m a very analytical person. I know my skills and limitations: where they lie and where they stop. I know when something is happening beyond what I am currently capable of. So I don’t care if anyone thinks I’m delusional. I own what I say here. I know what I have experienced and nobody can take that from me: I did my initial drawing and blocking in of the painting, in the faith that God won’t steer a parked car so I had better drive…and then I felt Him take the wheel. When I got to a place where I didn’t know how I’d place the strokes or what look the painting would have, I paused for a quick prayer, and immediately I felt Him take control of my decisions and my brush, and guide me into my new techniques. It has been a labor of love. What a gift that God arranged for me, in answer to my plea to find a way to serve Him that was custom-tailored around the talents He had given me. And to think I almost turned down the trip because of a dumb fear. I actually heard more gunshots in my own neighborhood the first 24 hours after returning home, than I had in eleven days in Israel, including 5 days in Jerusalem! How silly of me to have hesitated, knowing there’s nothing I can really do to alter the number of days He ultimately planned for me to live anyway. I must say that Israel was far more beautiful than that which is depicted in many movies set in Biblical times generally shows. Much of the land of milk and honey is a varyingly lush, blooming oasis in the Middle East, and my artist’s face was wet with gratitude at being able to witness it, and to walk the steps that Jesus trod, and to be able to witness layers of history excavated before my very eyes. I recommend a visit to the Holy Land for every believer – and even for those who aren’t…and it may just make a believer out of you, if you dare. When I returned home, I was exhausted but exhilarated, and among ideas for paintings, I started writing a book about my trip, and separately I created a slideshow-video of some of my best photos – played to a background of me reciting a poem I that wrote about the journey. This was an experience that produced a creative tour-de-force. If that weren’t enough of a present, my methods and techniques began to evolve further as I’ve already mentioned, and I embraced experimentation in a way I hadn’t for years. I’ve progressed so much that I may have to edit my artist statement. When I embarked into this style, I was acutely aware that matter and light were of a particulate nature: that all things, living and otherwise, are made of atoms with electrons furiously spinning about their respective nuclei, and that light is a blast of speeding photons. I was thinking on an “atomic” level, and was using that microcosm to allude to the parallel that we humans, however different we may seem superficially, are all made of the same stuff – unique yet unified. Now, in the Holy Land series, I have progressed into showing the relationships between these entities, by making my brush strokes and shapes interrelate in a more “molecular” way. It is not enough that we have things in common; it is imperative that we recognize and act on those common bonds by nurturing relationships. And now my subject matter is sites that were significant in the life of Jesus Christ, He who became the very liaison between the Creator and the created. There is no higher relationship I could portray. I chose not to depict literally the countenances of Father, Son or Holy Spirit; rather to use the light and beauty of nature, another creation, to, appropriately, reflect Them. Then, to reinforce the participation of the Trinity in my visual message, I include the Word, or scripture, within the compositions – scripture that is relevant to the scene illustrated and is relevant to those who read it, regardless of their understanding or even agreeing with it; it is a relationship offered nonetheless, in the context of free will and dependent on one’s voluntary acceptance since, by definition, true love, respect and loyalty can only be given, not taken by force. Similarly, this same push-and-pull tension is also described in the relationship between brush strokes, among which the scriptures are nestled and purposely partially camouflaged, necessarily so one must come closer to read them – just as one must meditate on the Word to absorb its meaning. The paintings are each two works in one; from afar one sees a realistic scene, but close up one is confronted with intricate patterns and harmonies, creating that Gestalt that the whole is greater than the sum of the parts. This echoes the responsibility of all humanity to keep a balance between the big picture and the important details, a dichotomy not unlike that of our calling as believers – to repeatedly attempt to transcend humanity while still shackled to it and all its flaws; to balance self and others; to balance discipline and compassion; to balance life in this realm versus that in the next. Mindfulness in relationships are key, and as one progresses, the journey is every bit as important to consider as the destination. It bears mentioning that each individual’s act of creating is yet another testimony to the fact that we are made in our own Creator’s image, a divine gift He gave us to feel kinship with Him. I can scarcely wait to finish this series and dive into the next one, since I have several waiting in the wings and my mind is so full of ideas, I wish I didn’t have to sleep (and I really like to sleep). I even have yet another Israel series planned beyond the collection for our particular house of worship. You may have noticed this post is only illustrated with a few details. I feel it wouldn’t be right to show the finished paintings here before I present them to their ultimate home. Looking forward to the day I can post all the finished works after the unveiling at church! 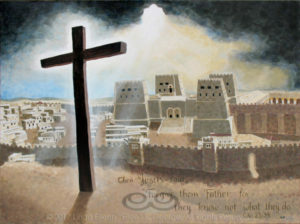 This entry was posted in Faith, New Art! and tagged Finding my-no-HIS Way, New Art, Perseverence on January 3, 2017 by Aiii.